Location, Views, Size, Quality, Comforts = Best Sv Home Deal!! 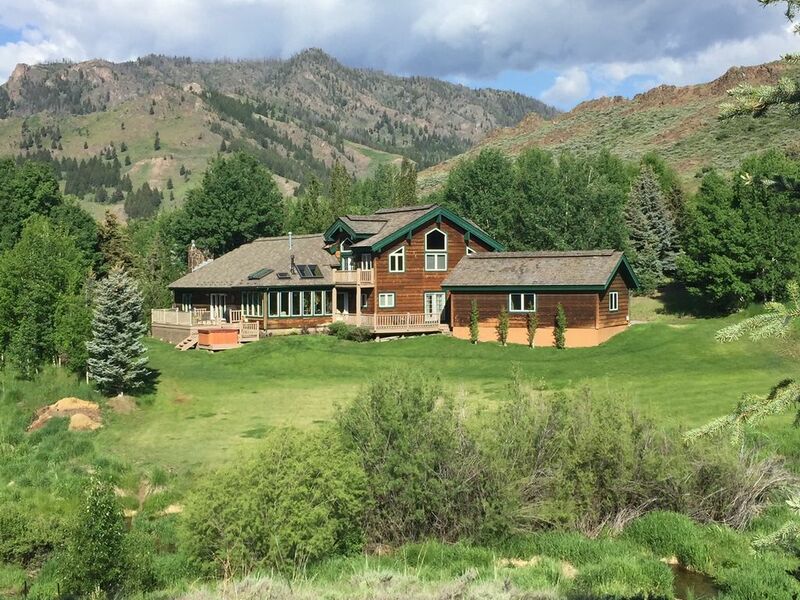 Located in the sparsely populated Lake Creek valley neighborhood, our home enjoys proximity to town, just two miles NORTH of Ketchum/Sun Valley, as well as privacy, views, seclusion and open spaces. You will immediately notice that this is a home, not a "rental." It has loving attention to comfort and feel-good style, with pretty much everything you would find at your own place. The close proximity of both town and nature, combined with the exceptional attributes of the house and the very fair price, make our home an unbeatable choice for those who love Sun Valley. Sun Valley visitors are nature lovers who crave space, sunshine, views, privacy, dark night skies and room for the dog to roam. They like to be free of commute traffic, congestion and other complexities they're trying to leave behind in cities, and to be close to the river, convenient to hiking, biking and fishing, the incomparable downhill ski facilities, and the world-class cross-country skiing. Then, they like their accommodations to be NICE - tastefully decorated, fresh, uncluttered, exceptionally clean, fully-equipped, spacious and airy but likewise cozy and comfortable, and with a bathroom for every bedroom, a hottub, an extra living room with extra audio-visual... and of course a big granite kitchen open to everything. Oh, and they like it to be fairly priced. Well, that's this house... four doors from Governor Schwarzenegger and about a mile from Senator and Theresa Kerry in one of Sun Valley's most desirable and lightly populated NORTH valleys, just two miles from central Ketchum, an easy tra la la on a bike into town for dinner, concert, craft fair, etc. By car it's a quick five minutes to those activities or to park by the lifts in winter. Compare this property to all those agent-represented deals - we understand that you are looking for value! Now, as of the beginning of 2017, a 300sf "sunroom" projects into the wonderful east and south views of Lake Creek and surrounding peaks. The new space provides for a third hospitality/conversation area, one without TV and meant to just enjoy the view and the modern gas log wood stove at the opposite end of the great room from the cozy TV seating area. Thus the finished great room, wide open to the kitchen of course, now extends from light-filled east end to movie-ready west end, with gas log fireplaces on each end and with a glamorous round dining ensemble in the middle. This affords our guests the luxury of choosing between, say, football games or the serenity of the mountain setting and possibility of, for example, watching visiting elk groups in their search for winter shelter. "Office" functions are in a corner of the sunroom, giving those who indulge in work while away the pleasure of the eastern mountain views. The spacious loft area, with audio-visual components as well as exercise mat and weight-lifting bench, we now call the "playroom." It's set up for pursuits such as yoga, meditation, play, puzzles or projects - and there's another desk there too. The big central kitchen is granite and stainless steel and has been called by some of our guests "the best-equipped kitchen" they've ever rented. It has the equivalent of three ovens, gas stovetop - and even the latest thing: Instant Pot. There's seating at the center isle for cooking "assistants." Another big advantage of our place is the sleeping arrangements. Four bedrooms, each with their own bath, and each bedroom in its own wing. On the main level, off the entry, is the totally private guest suite, consisting of three rooms (bedroom/bath/sitting area). The suite bedroom has a queen, and the sitting area, with large-screen audio-visual, also has a queen sofa sleeper. The main level guest bedroom has twins that can be kinged and ensuite double-vanity bath with tub/shower. Upstairs there's an identical guest bedroom with twins that can be kinged and a double-vanity full bath with oversized shower. This room is separated from the very large master suite (900sf) by the playroom. The master is airy with hideout sitting areas for quiet time and enjoying the view or perhaps catching a specialty TV event. There's a big walk-in changing area, double vanities, corner jet tub, oversized glass shower, separate WC. So finally, the house has three separate sitting areas, two gaslog fireplaces, two desks, wifi throughout, an Amazon Echo, and four TVs, all with streaming. The main living room TV is ia 65' curved-screen Ultra High Def 4K Samsung Smart TV (with DVR and sound bar surround system). Externally, there's a 3-car attached garage, decks, private "aurora borealis" hottub, cute playhouse among the aspens, gas BBQ, outdoor summer dining, a huge lawn going down to the creek. .... from the moment you arrive you'll be saying this is just what you were hoping for! Because Lake Creek flows next to the property, much of the nearby land is remains open, natural, green (or white) and surrounded by nearby mountain peaks. You won't find this home cluttered with personal stuff. The cabinets and closets are empty and ready for your use! The decorating features art quilts, live plants, wood and color, tiffany-style lighting in the sunroom; the emphasis is on home-style comfort from which to enjoy the incomparable outdoor environment. The Lake Creek Trailhead, Sun Valley's best mountain biking, hiking, and fishing area, is just down the street. Take the dog for a swim in the river while you cast for catch-and-release whoppers. And in winter the same trailhead begins the pristine grooming of the North Valley Trails for classic and skate skiing. Just five miles up the highway is where the famous Boulder Mountain Trail, with the same amazing grooming, heads north for 35k - doggie trails too! Downhill skiing is in the other direction, just two miles to access either River Run or Warm Springs at Baldy or to park at Dollar Mountain, the absolute beginner area adjacent to SV proper. WATCH OUT FOR AGENT-REPRESENTED PROPERTIES! You will pay much more for what you get. Be especially aware of location factors. Anything south of Ketchum is in the commute traffic! If our's isn't the right property for you, ask us for guidance or ideas. We are active seniors (71 & 87). Just the two of us at this point. One son lives locally and helps look after our place when we are elsewhere. We are big skate skiers and actually pretty much abandoned gravity-based skiing for the self-propelled variety, considering the wealth of groomed trails in the wilderness. We mountain bike and road bike, utilizing the very extensive bike trail and roads in all directions. Nick has a membership at SV Golf and loves the new White Clouds course which actually occupies the uplands between our home and SV Village. Hiking is a regular thing for Kathy, pretty much all-season; the environment seems custom-made for snow-shoeing, as the pyramidical mountains are like being on the most scenic of all possible stairmasters. And the weather, of course, is probably the best on the planet. ...we are not the only ones who say that the Sun Valley climate is just about perfect. There are said to be 300 days per year of sunshine. Nothing is ever extreme, nights are cool (AC rarely needed), and every morning in summer gives you a taste of springtime before warming to lusher temps. So it's the weather, to start. But then there's the uniqueness of the 'resort.' SV is like no other resort because, fundamentally, the place is not owned by a corporation; it's owned by a family-owned oil company (Sinclair), and profits do not have to be distributed, or even reported. So the company invests in grand facilities and answers to no one, presumably just treating it all like a tax haven. Well, the upshot is we have beautiful, exceptional facilities but the place isn't set up like an arcade, just for raking in money. It's done for taste and style and experience, not for bottom lines. Does that explain anything? SV has everything you want, but doesn't have so much of what you don't want - like malls and fast food joints and strip development. The valley is very small (only a half-mile or so across where Ketchum sits), so there's no room for sprawl. This makes it expensive, no doubt about that, but the removal from commercialism is quite rewarding. Our house is in what many say is the best location in the valley. First, you don't have any commute traffic influencing the roads. Then, it's CLOSE to Ketchum/SV, so easy to access the attractions of town and ALSO just go down the street to swim or fish in the river or to hike or trail jog or mountain bike in all different directions, or drive northward to the wilderness areas, skate skiing, lakes and epic mountain outings in four separate and distinct mountain ranges, ... But, with that proximity, the setting is all mountains and open spaces. Lake Creek valley is very sparsely inhabited, owing to estate-style development. The neighborhood is pretty splendid - the governator chose it for a reason. We hike/jog right out our door. Dogs are blissful here as they get the freedom not found in 'fenced yards,' without much of a car factor. Wildlife ambles through, especially while we are doing twilight hottubs. After dark, remarkably, it's pretty much a dark sky, and all the constellations are displayed as you never see them in cities. As for the house, it's always so comfortable to have guests because their bedrooms are totally private. The house is easy to keep cool in summer. Some features we enjoy are the big, multi-cook kitchen, my mother's wonderful art quilts and Nick's father's original artwork, the stylish Bhutan area rugs, the beauty of the Tiffany style lighting for evening get togethers,the excellent audio-visual arrangements for catching all the essential sports events, the very separate guest suite where kids like to hang out away from the adults, the spectacularly comfortable beds which at 'our age' are crucial, the fact that we can have enough twin beds for most group configurations, or they can be kings, the airy entryway for leaving transitional footwear and garments, the spacious and connected three-car garage. Sparsely populated Lake Creek valley has mountains all around. Traffic, not seen or heard from the house, doggie freedom and a gentle sledding hill on the property. Big sledding/snowshoeing hills all around. Small kids right in the yard, bigger adventurers across the (frozen) creek. The lower yard makes an excellent soccer field, or a place to build snow structures. Multiple gas furnaces so that bedrooms can be heated separately from main living areas. Almost all linens are extra-high thread count. A huge supply located in the applicable bathrooms. Home network works everywhere in the house. Has gaslog fireplace and 65' UHDef 4K curved screen Samsung smart TV with Blu-ray DVD, streaming. Side-by-side freezer in stainless with icemaker. You will find it totally empty. New 2-oven gas range plus 'Advantium' microwave 'speed cooke' oven above, with electric convection. PLUS, for things like turkeys, a new 'super wave' oven by Sharper Image - best birds ever! This is a multi-function Advantium: halogen plus microwave plus something else for faster better cooking. Two sets of dishes, one china, one stoneware. Large and elaborate with counters ample for multiple cooks. There are seats at the center island for the onlookers. Pedestal table expandable to seat up to 10, upholstered, cushioned Pottery Barn chairs. Four TVs: Living room & suite sitting area have HD and DVR capabilities. There are streaming devices for Netflix, Amazon, Showtime, Starz with all TVs. There's an Amazon Echo with Spotify. Main TV's wireless soundbar system can be bluetooth synched with your phone or iPod. Blu-ray player plus streaming device with main living room TV and in the playroom. Puzzles and games and toys in the playroom storage areas, with portable tables, one adjustable for different heights. Very extensive lawn, big enough for a mini-soccer field on the lower part of the property, by the creek. World famous Bald Mountain and beginner Dollar Mountain, both 3 miles away with free parking. Almost 200 miles of groomed Xcountry ski trails available throughout the valley. This is workable, as downstairs suite is readily accessible from two-step entryway (could make ramp available). All other functions are on ground floor, including access to deck. Unbelievable views from this strategically located tub. There is no clutter whatsoever, Closets and cabinets are empty and equipment is optimized, Here are some of its attributes: bath for every bedroom, each bedroom in separate wing, remote-controlled gaslog fireplace, land-line phone, cable modem/wifi router, 4 TVs, 65' UHDef 4K curved screen Samsung smart TV,with DVR, Netflix Streaming, VCR & DVD in second living room, bluetooth sound bar sync system in main living room, office/library off master, large open granite kitchen, ice-on-door refrigerator, turnkey cooking and serving utensils, high-quality linens, washer/dryer, double jettub in master, outdoor hottub, 3-car garage, Gas BBQ, handbuilt playhouse in yard. There are a total of 4 ovens in the kitchen, all brand new. Great location with plenty of room. We had garage space which came in handy, since we got over three feet of snow during our stay. The drive got plowed quickly and one of owners came by to check up on us which was really considerate. We love to cook breakfast and dinner so the fully stocked kitchen was a real plus. Everything was clean and everyone in our group commented on the value we received from this property. This is our second trip to Sun Valley (from Alabama) and we chose Kathy's home for a second time because of our previous experience. It is perfect for our family of 6 adults and 1 child. The location is convenient to Dollar Mountain, River Run and Warm Springs lifts. Kathy's home is SO comfortable and spacious and the pictures are accurate! It has been renovated since our last visit and I didn't think it could be improved upon, but she's done it! The kitchen opens into the dining area and a new sunroom with floor to ceiling windows and skylights has been added with a wonderful gas fireplace. The views are fantastic. The hot tub is perfect for relaxing at night with an incredible view of the stars. I can't say enough about how accommodating Kathy is to her guests. She responds promptly to inquiries and has great advice on restaurants. When we return to Sun Valley, we will stay at her home! Thank you for your kind words, Michele, and may I say that you and your family are five-star-PLUS guests and will always be very welcome to grace our home. Kathy was so helpful, a wonderful owner. She did everything possible to make sure we were accommodated and comfortable, all before we arrived! Once there, all we had to do was enjoy the location, the scenery and the wonderful home. Just north of town, we had easy bike access to all the trails we had planned to ride. The hot tub did wonders to restore the body for another day of adventure and sleeping arrangements were so comfortable. Everyone had their own queen bed. In the end, once we arrived, I never had a need to call the owner, she had anticipated everything. Thank you Kathy, for your thoughtful hospitality and sharing your gem of a home with us. Thank you, Greg, for your kind words and taking the trouble to share with other prospective guests. You (and your bros) were five-star guests. Just one thing: those were king beds, not queen, except for one. Happy riding and please do come again! We had a wonderful time staying at the home for a week in August 2017. The house was just as described, with more than enough room for our family. Morning hot tubs with a view of the surrounding mountains were priceless. And Kathy was a fantastic host, accommodating in every way. Thanks for a great stay. We stayed at Kathy's home for a week in August and absolutely loved it there. The house is massive, immaculately clean, and decorated in such a warm and welcoming way. The interior was designed for rest and relaxation -- we never wanted to leave! Kathy thought of everything that a renter would need and we lacked for nothing - no comfort was spared. She was also available any time we had a question - we felt very well taken care of! Also, there must be some kind of magical insulation in the walls because we were there during a heatwave and somehow the house managed not to turn into an oven - it remained cool inside every day despite 88-degree weather outside! We loved the stunning views in every direction, especially from the sunroom where we spent most of our time. The front and back yards are meticulously maintained - as neat and trim as a golf course - and our dog had a wonderful time playing fetch there. The location can't be beat - it takes only 7-8 minutes to drive into downtown Ketchum. We highly recommend this rental and can't wait to come back. Thanks for everything, Kathy! Sun Valley is an outdoor paradise, not spoiled by commercialism. No outlet malls, fast food joints, The town is sophisticated but SMALL, friendly with great restaurants, No waterslides or amusement parks, but PLENTY to do as we are surrounded by public lands, mountains, streams and wildlife. World-class flyfishing is a major attraction, and the river is 2 blocks from our house. There is a YMCA with a fun indoor pool system, elaborate climbing gym. The area has a 30-mile bikepath, much of it riverside. Take a lift to Baldy summit, or hike or ride a bike up it. The ride down is free (easy on the knees). Or take the gondola for fine dining at mid-station. SOME attractions, Road and Mountain Biking, endless hiking, White Water Rafting, 220 Kilometers Groomed Skate and Classic Cross-country Skiing, Paragliding on Baldy, Car-access or hike-to Mountain Lakes, Wine Auction, Arts/Crafts Festivals, Quality local theater, Free Outdoor Summer Symphony (unbelievable outdoor pavilion). Labor Day/4th July parades... Oh yes, there's Mount Baldy! All requests are subject to review by owners before acceptance and are considered case-by-case according to our goals for our property and our time. The fact that the property shows open on our calendar does not guarantee acceptance. Accepted stays of five nights or fewer during either high winter or summer seasons may be subject to a $250 departure cleaning fee. A dog may be considered on a case by case basis. We are dog lovers. We have a rental agreement posted on this site, and agreement to its terms are a condition of all reservations. Should any dispute occur, this document's provisions are the controlling terms, not those of a credit card company or a subcontractor of the Homeaway websites.